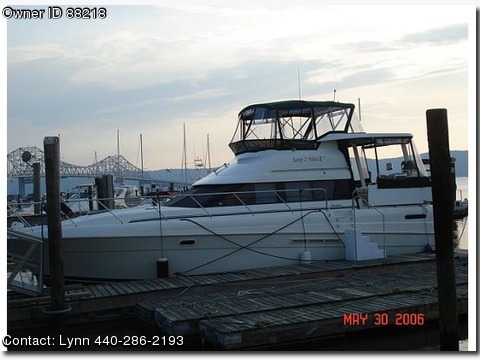 · Aft Cabin · Air Conditioning · AM/FM Radio · Bilge Pump · Bow Pulpit · Carpet · CD Player · Depthfinder · Dingy · Dockside Power · Documented · Fishing Gear · Full Canvas · Galley · Generator · GPS · Halon · Hard Top · Head · Hydraulic Steering · Loaded · Loran · Microwave · Professionally Maintained · Radar Arch · Refrigerator · Shower · SS Prop · Storage · Stove · Swim Platform · Trim Tabs · TV · Two Batteries · VHF Radio · Windlass This boat is a MUST SEE! It has been professionally decorated and professionally maintained. The boat is prestine with amazing decor and is fiully loaded with all the amenities. Complete with 2 large state rooms, each with private heads and stand alone showers. The galley is outfitted with corian countertops, full size refrigerator, 2 top stove, toaster, and microwave/convection oven to support the finest culinary interests. The spacious salon has 6'5" of headroom is fully loaded with a wetbar and state of the art entertainment system, flat screen tv, and xm radio. It also has a custom made Italian leather L-shaped sofa that is also a double pull out. The exterior is just as impressive. The aft deck has plenty of seating and another wet bar to sit and relax and enjoy the warm sea air. The bridge is loaded top of the line electronics, beautiful 360 degree views and plenty of seating and storage. This boat is truly a rare find with only 150 hours! We are looking for someone who will love it as much as we do!